SPICEWOOD — As Barbara Tweed looked through photos from a past Fourth of July parade in Spicewood, she laughed at several that caught her attention. 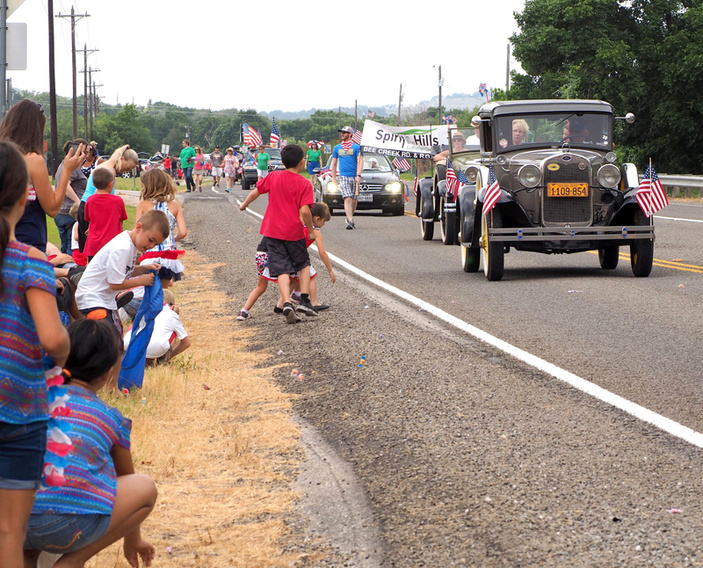 If you don’t want to be in the community’s Fourth of July parade, which is sponsored by the Spicewood and Highland Lakes Lions Club, you can just find a spot along the route and enjoy it. Tweed, a member of the Lions Club, said the organization started the parade several years ago because Spicewood didn’t have one. The parade reflects the local community: a bit laid-back and informal. The parade, which includes a picnic afterwards, gets rolling at 9 a.m. from the Spicewood post office, 121 Spur 191, and heads down the road before eventually ending up at Spicewood Community Center, 7901 CR 404. At the center, folks can enjoy hot dogs, sodas, and a few other things. “Every year, someone always shows up with watermelon,” Tweed added. The parade features a mix of floats and walkers. People sometimes walk with their kids — both that goat and the human kind. Of course, there are entrants riding bikes, cruising along on old (and new) tractors, riding ATVs, or taking it all in from a convertible. If you have a golf cart, decorate it in red, white, and blue and bring it out. “We even have a guy that follows along in his wheelchair, so come on out,” Tweed said. Call (830) 693-3645 or go to spicewoodlions.org to register your float. For those who just want to watch the parade, there are plenty of spots along Spur 191 and CR 404 (from Spur 191 to the community center) to park and get a good view. Just be sure to stick around for the hot dogs and fun at the community center.